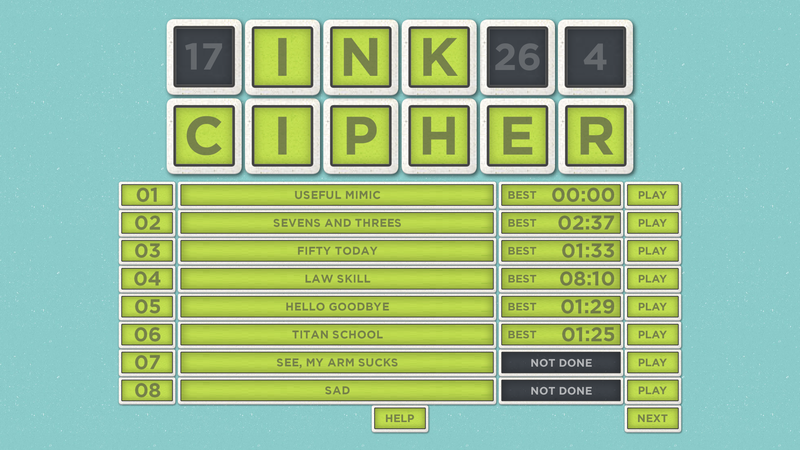 Decode the cipher in Ink Cipher! Ink Cipher is a sleek take on the puzzle sometimes known as the “cipher crossword”, “codeword” or “codebreaker”. You’re presented with a grid filled with words… except all the letters have been replaced by numbers. Each number represents its own letter. Using your knowledge of the English lexicon, fill in the letters where you can recognise words and crack the cipher! Currently features 11 codes to solve. Will be updated in time. Game is touch friendly (requires no keyboard input), intuitive to play for anyone, and contains a lil help screen on how to play.